This article is about the 1966-82 Fiat 124 Spider. For the 2016 Fiat 124 Spider, see Fiat 124 Spider (2016). For the 124 Coupé, see Fiat 124 Coupé. For the 124 sedan, see Fiat 124. The Fiat 124 Sport Spider is a 2+2 convertible sports car marketed by Fiat for model years 1966-1985. Designed by and manufactured at the Italian carrozzeria Pininfarina factory, the monocoque, front-engine, rear drive Sport Spider debuted at the November 1966 Turin Auto Show with styling by Tom Tjaarda. Fiat later marketed the car as the Spider 2000 (1979-1982). After being retired by FIAT, Pininfarina continued the production of the model under his own brand as Pininfarina Spider Azzura for the North American market and Pininfarina Spidereuropa for the European market for three more years, from 1983 until 1985. Honoring its legacy, in 2015 a successor of the Fiat 124 Spider was presented at the LA Auto Show. The Fiat 124 Sport Spider was designed by Pininfarina and styled in-house by Tom Tjaarda. The 124 Sport Spider, 124 Sport Coupé and 124 sedan share much of their running gear – and, in the case of the coupé, platforms. The Sports Spider uses a shorter platform along with a shorter wheelbase, and in contrast to the Pinifarina styled and manufactured spider, Fiat designed and manufactured the coupé in-house. The succession of build series of the 124 were designated internally as AS, BS, BS1, CS and CSA. AS models had a torque tube transmitting power to the rear wheels; this crack-prone design was replaced by a trailing-arm rear axle with the second series (BS) during 1969 — which was manufactured alongside the AS for the first six months of 1970. The early AS cars also have smaller taillights, while the BS receives a mesh grille and black-rimmed gauges inside. In July 1970 the 1.6-liter BS1 appeared; this model is recognizable by its twin humps on the bonnet and bumper overriders. The CS series Spider arrived during 1972. Also in 1972, a sports version of the Spider debuted, required for type-approval of its rally version, and was marketed as 124 CSA (C-Spider-Abarth). The vehicle has a capacity of 128 hp. In three years, Fiat manufactured less than 1000 CSA models, which were intended for sale to individual clients. The four-cylinder engine used in the spider and coupé is a double overhead cam, aluminum crossflow head version of the sedan's pushrod unit. It started in 1966 with a capacity of 1438 cc progressively increasing to 1608 cc in 1970 (although this was reduced to 1,592 cc in 1973), 1,756 cc in 1974 and finally 1,995 cc in 1979. The Fiat twin cam engine was designed by ex-Ferrari engineer Aurelio Lampredi. Bosch fuel injection replaced the previously used Weber carburetors midway through 1980. In 1981 and 1982, Fiat USA, Inc. partnered with Legend Industries to create approximately 700 turbo models for US markets. There was also a supercharged model called "Volumex" offered toward the end of production, which was sold only in Europe, where it cost 35% more than a regular, fuel-injected Spidereuropa. [a] This family of engines remained in production into the 1990s giving it one of the longest production-runs in automotive history. The double overhead cam (DOHC) version was the first mass manufactured DOHC to utilize reinforced rubber timing belts, an innovation that would come into nearly universal use in the decades after its introduction. Its family powered race cars such as the FIAT 131 Mirafiori, 124 Special T, Lancia Beta Montecarlo, Delta Integrale and many others. Suspension is conventional by unequal length wishbones and coil over damper at the front and by coil sprung live rear axle at the rear which is located by a transverse link (Panhard rod) and two pairs of forward extending radius rods to react to braking and acceleration forces, and to control axle wind-up. The coupé and spider were marketed in the US market beginning in 1968. In 1969, the Spider featured four-wheel disc-brakes, double overhead cams, hesitation wipers, steering-column mounted lighting-controls, radial-ply tyres and a five-speed manual transmission. An optional three-speed automatic transmission from General Motors was available from 1979 through 1985 for North America as well as Japan. The Spider's convertible top was known for its simplicity of use — allowing a seated driver to quickly raise or lower the top. When the engine was upgraded to two litres, the model was renamed the Fiat 2000 Spider. For the 1980 model year a version with a catalytic converter and Bosch L-Jetronic fuel injection was introduced for California and optional in the other 49 states. For 1981 this engine, with 102 hp (76 kW), became standard fitment in North America. Fiat subsequently stopped marketing the Spider and the X1/9 — to have their marketing assumed by their respective carozzerie. In Europe, the Ritmo Cabrio was also marketed by Bertone rather than Fiat themselves. In the US, Fiat turned over marketing and support of the spider and the X1/9 to International Automobile Importers, Inc., headed by Malcolm Bricklin. The Fiat Abarth 124 Rally is a street legal rally version of the 124 Sport Spider sold to the masses, known also as "124 Abarth Stradale", introduced in November 1972. Its main purpose was to receive FIA homologation in the special grand touring cars (group 4) racing class, and replace the 1.6-litre Fiat Sport Spider rally cars which were presently being campaigned. At the time 124 had already won the 1972 European Rally Championship at the hands of Raffaele Pinto and Gino Macaluso. The 124 Rally was added to the Sport Spider range, which included the 1600 and 1800 models; the first 500 examples produced were earmarked for the domestic Italian market. Amongst the most notable modifications over the standard spider there were independent rear suspension, engine upgrades, lightweight body panels, and a rigid hard top. In place of the usual rear solid axle, there is independent suspension from lower wishbones, the original trailing arms, an upper strut and an anti-roll bar. At the front a radius rod on each side was added to the standard double wishbones. The Abarth-tuned type 132 AC 4.000 1.8-litre, twin-cam engine was brought from the standard 118 to 128 PS DIN (94 kW; 126 hp) by replacing the standard twin-choke carburettor with double vertical twin-choke Weber 44 IDFs, and by fitting an Abarth exhaust with a dual exit muffler. The 9.8:1 compression ratio was left unchanged. The transmission is the all-synchronised five-speed optional on the other Sport Spider models, and brakes are discs on all four corners. Despite the 20 kg (44 lb) four-point roll bar fitted, kerb weight is 938 kg (2,068 lb), roughly 25 kg (55 lb) less than the regular 1.8-litre Sport Spider. Engine bonnet, boot lid and the fixed hard top are fibreglass, painted matt black, the rear window is perspex and the doors aluminium. Front and rear bumpers were deleted and replaced by simple rubber bumperettes. A single matte black wing mirror was fitted. Matte black wheel arch extensions house 185/70 VR 13 Pirelli CN 36 tyres on 5.5 J × 13" four-spoke alloy wheels. Inside centre console, rear occasional seats, and glovebox lid were eliminated; while new features were anodised aluminium dashboard trim, a small three-spoke leather-covered Abarth steering wheel, and Recaro corduroy-and-leather bucket seats as an extra-cost option. The car carries Fiat badging front and rear, Abarth badges and "Fiat Abarth" scripts on the front wings, and Abarth wheel centre caps. Only three paint colours were available: Corsa red, white, and light blue. In 1971 the 124 Spider was prepared for the World Rally Championship when Abarth became involved with its production and development. Abarth designer Ing. Colucci was responsible for getting the 124 Spider into Group 4 rally trim. Over this period the Abarth Spider was relatively successful with wins at the 1972 Hessen Rally, Acropolis Rally, 1973 Polish Rally, 19th on the 1973 RAC rally and seventh to mostly the Alpine Renaults on the 1973 Monte Carlo Rally. The Spider continued to perform with first, second and third in the 1974 eighth Portuguese TAP Rally, sixth in the 1974 1000 Lakes, fourth in the 1975 Monte Carlo Rally and also with Markku Alén driving the spider to third place. By 1976 the days of 124 rallying were numbered due to the appearance of the Fiat-Abarth 131. The model ended in 1985 after almost 200,000 spiders alone had been manufactured, with 75% for the US market. There were nine models of the spider, the AS, BS, BS1, CS, CSA (Abarth), CS1, CS2, CS0, and DS. The 124 name was revived in 2016 through a joint venture with Mazda, using the new Mazda MX-5 platform. After considering possibly marketing the result as an Alfa Romeo Spider, the car was brought to the market as a Fiat. It was unveiled at the Los Angeles Auto Show in November 2015 and made available in late 2016. The engine is a turbocharged 1.4 MultiAir with 160 HP (119 kW) from the Fiat range. ^ Tom, Tjaarda. "Fiat 124 Spyder Design Story". spidersweb.nl. Retrieved 16 May 2013. ^ a b c d Bensted-Smith, Richard (5 November 1966). "Sport-out of Fiat 124: The 124 spider; larger engine: twin overhead camshafts; Pininfarina 2+2 body". The Motor: 25–27. ^ "Fiat 124 Spider revealed at 2015 LA Motor Show". Auto Express. Retrieved 20 November 2015. ^ Thorson, Thor (May 2016). "1975 Fiat-Abarth 124 Sport Rally Group 4 Spider". Sports Car Market. 28 (5): 70–71. ^ World Cars 1984. Pelham, NY: L'Editrice dell'Automobile LEA/Herald Books. 1984. p. 222. ISBN 0-910714-16-9. ^ a b Hogg, Tony (ed.). "1981 Buyer's Guide". Road & Track's Road Test Annual & Buyer's Guide 1981 (January–February 1981): 96. ^ a b c d e f g h "Fiat Abarth 124 Rally—La 124 R con la sospensione alla Chapman" [The 124 R with the Chapman-style suspension]. Autosprint (in Italian). XII (47): 36–37. 20 November 1972. ^ a b c d "La "124 Rally", nuova sportiva". La Stampa (in Italian). 19 November 1972. p. 11. Retrieved 21 July 2015. ^ a b Fiat Abarth 124 Rally—Uso e caratteristiche (owner's manual) (in Italian). Fiat. ^ "Produzione complessiva" (PDF). pininfarina.it ((Pininfarina production records)). Archived from the original (PDF) on 2011-06-05. Retrieved 2007-08-03. ^ Horncastle, Rowan. "Meet Fiat's 124 Spider, Italy's MX-5-based answer to the MX-5". Top Gear. BBC Worldwide. Retrieved 18 November 2015. 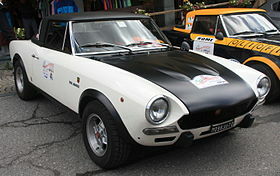 Wikimedia Commons has media related to Fiat 124 Sport Spider.